What happened at Fukushima—and what does it mean for U.S. nuclear power? Written by nuclear experts in compulsively readable detail, this book takes a moment-by-moment look at what went wrong at Japan’s Fukushima nuclear power plant. The book draws on firsthand accounts, as well as detailed technical records and media coverage, to recreate the events preceding, during, and after the meltdowns of three of Fukushima’s nuclear reactors. The authors also address whether or not a Fukushima-scale nuclear disaster could happen in the United States—with sobering (but actionable) conclusions. The book is a gripping, suspenseful page-turner finely crafted to appeal both to people familiar with the science and those with only the barest inkling of how nuclear power works. Years of poor regulation and inadequate safety controls left the Fukushima Daiichi nuclear power plant dangerously unprepared when an earthquake and resulting tsunami hit in March 2011. Fukushima’s aftermath includes hundreds of square miles of uninhabitable land, tens of thousands of relocated people, and billions of dollars of economic loss—ranking it alongside Chernobyl as one of the world’s worst nuclear disasters. Ongoing challenges with managing the damaged reactors—and concerns about radiation releases—mean the Fukushima disaster is far from over. Buy the book to learn about Fukushima’s consequences. Interested in your local nuclear reactor? 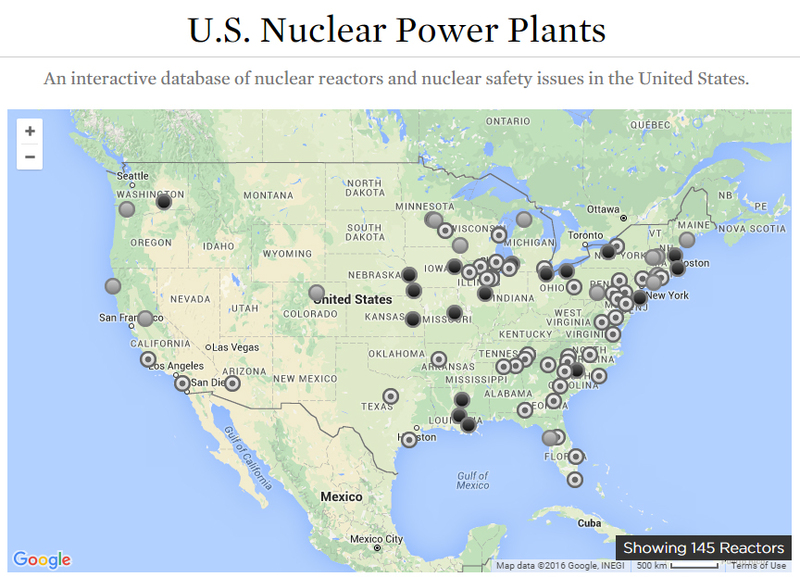 Use our database to research nuclear safety issues in your area. Fukushima wasn’t a “Japanese” nuclear accident—it was an accident that happened to occur in Japan. In fact, if exposed to similarly complex challenges, all 99 operating reactors in the United States would likely have similar outcomes. Worse, Japanese and U.S. regulators share a mindset that severe, supposedly “low probability” accidents are unlikely and not worth the cost and time to protect against. Fukushima showed that unlikely events do occur. Buy the book to learn what Fukushima means for U.S. nuclear safety. Anyone seriously interested in understanding the issues involved in delivering ‘safe’ nuclear energy will be rewarded by reading this book; anybody involved in delivering nuclear power should be required to read it. Despite a long history of complacency and underestimating risks, the U.S. agency charged with nuclear power—the Nuclear Regulatory Commission (NRC)—could heed the lessons of Fukushima and improve U.S nuclear safety. Unfortunately, the NRC hasn’t learned Fukushima’s lessons—and U.S. nuclear power plants aren’t as safe as they could and should be. Buy the book to learn what can be done to prevent another Fukushima, or learn more here. Dave Lochbaum and Edwin Lyman are two of the nation's top nuclear power experts, having testified in front of Congress multiple times, including on Fukushima. Susan Q. Stranahan is an award-winning journalist who has written on energy and the environment for over 30 years. She was part of the team that won the Pulitzer Prize for their coverage of the Three Mile Island accident.